Sometimes, a client wants to pack as many new experiences and challenges into a day as possible. 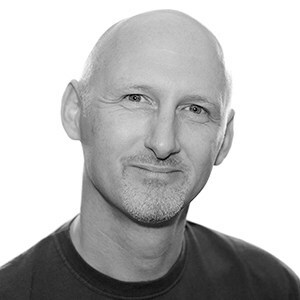 With that very brief, I sat down with Chris Cordery, Director of Aurora TDS Limited, to create a program of non-stop surprises for a long-term client of his. Having understood what the group had done in the past at off-site team building events, Chris and I picked a totally different direction to go in and a list of team activities that would keep everyone engaged and guessing as to what was coming next. So, at the end of September and after an innocent lunch, the unsuspecting senior management team got to catch up together for something unique. Here is a video of the event, with interviews with participants. 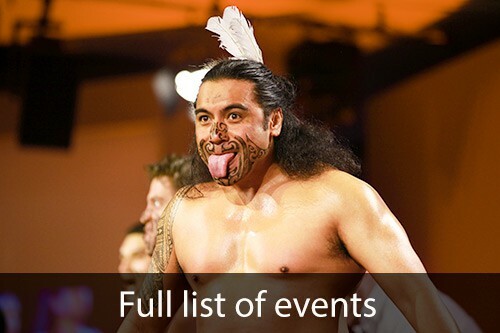 We kicked off in style with Haka, with our Maori warrior bursting in and brandishing traditional weapons. After adjusting to this very new situation, the group first heard the background to Maori tribal history and the fascinating creation of the now-world-famous Haka Kamate. After this, of course, everyone got on their feet to learn the moves and words to create two scary mini tribes performing the Haka to each other. While all this was going on, secretly behind the venue, the next activity was already ‘hotting up’. A fire professional was creating a blaze of oak logs on a bed of layered turf in preparation for a fire walk. 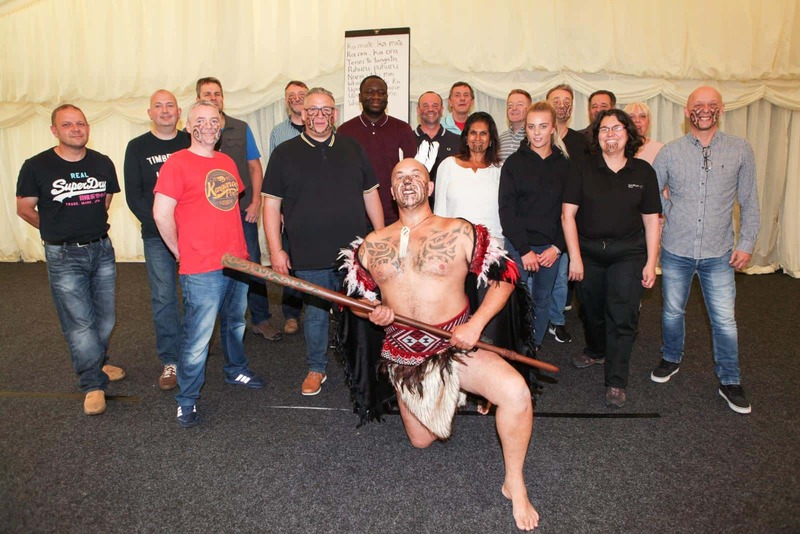 Yes, our novice Haka warriors, now fully alert and ready for anything, were going to learn how to walk barefooted over burning hot coals…safely. This activity is obviously not for the fainthearted and has to be led by an instructor with the utmost experience and professionalism. Thank goodness Steve, our fire walk master, has presided over thousands of fire walks on top of being a Special Forces instructor with a distinguished military career. The group came back from coffee to be greeted with the news that, after an hour of training and mind preparation, they would be taking a brave step into the red hot unknown. For this to happen successfully, we had to discuss fear, comfort zones and trust. Steve prepared the group with smaller physical tasks to clearly show that the mind can create barriers that, in reality, do not exist. With clear instructions using logic and courage, our group saw each other breaking wooden boards with their hands, smashing arrows with their throats and even bending iron bars! With this new internal confidence, it was time to walk outside to meet the glowing hot embers that stretched before them. Under careful facilitation and a demonstration, it was time for the participants, one by one, to step onto the glowing path before them. As you can see on the video, everyone walked perfectly across but those very first steps really were leaps of faith. Fire walking always provides a fantastic lesson in breaking through preconceived thought obstacles. The following morning, we thought we would ease our, by now, suspicious group into their second day. After breakfast, all members of the group walked out onto a misty lawn to be greeted with the sound of a low drone and man-made animal screeches emanating from the didgeridoo. We had brought the UK’s finest exponent of this mysterious instrument. Not only that, we had brought a didgeridoo for every individual to learn on and then take home. At first, there were raised eyebrows. We had multiple squeaks, squawks and failed raspberries but, before long, the room was filled with the unmistakable booming sound. 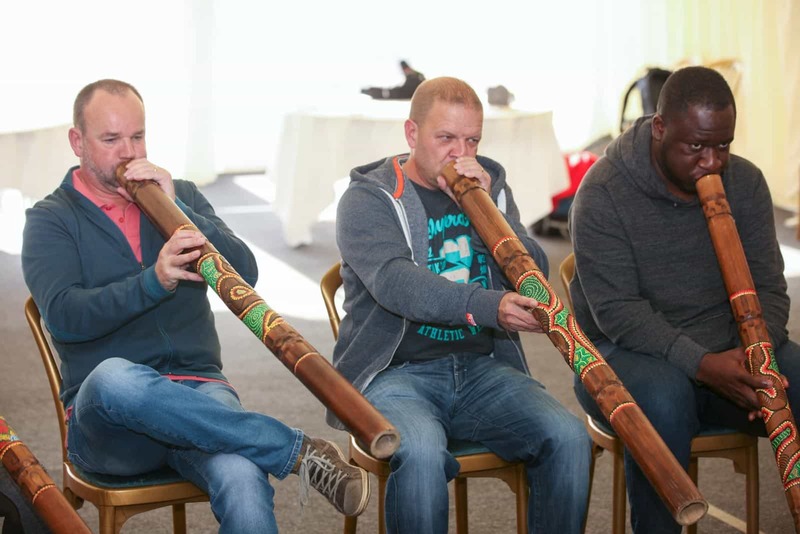 There are many challenges to learning the didgeridoo particularly when it is hard for participants not to laugh at themselves and their colleagues. Unfortunately, it is impossible to play and laugh at the same time, so sidesplitting discipline really plays a part! After coffee, the group returned, to a very new working environment. We had secretly sneaked in a drum for everyone and we finished the day by transforming the group into a mini drumming orchestra. This was the perfect way to end our 24-hour journey of surprises. The drumming session encompassed many of the lessons of the previous activities. Just like in the Haka, when the entire group all started or stopped as one, there was a sense of the real power of the group. As the participants discovered in the fire walk, by trusting and focusing on the training given, you can do much more than you believe. Furthermore, just like the didgeridoo, you should never give up until you get the desired result. The afternoon concluded with the group being able to improvise together, listening perfectly and creating their own drumming piece. We would like to thank our client SH Pratt and the trainer that had the vision to suggest all this, Chris Cordery. If you think that your own team would benefit from a programme of constant changes and new challenges to conquer together, please get in touch to create your own bespoke experience. Please Contact Us now.